Wayang (Puppetry) is an indigenous cultural art from Indonesia which is prominent and still exist in the middle of modern era. In development of wayang, it used to preach, education, understanding philosophy, and entertainment. 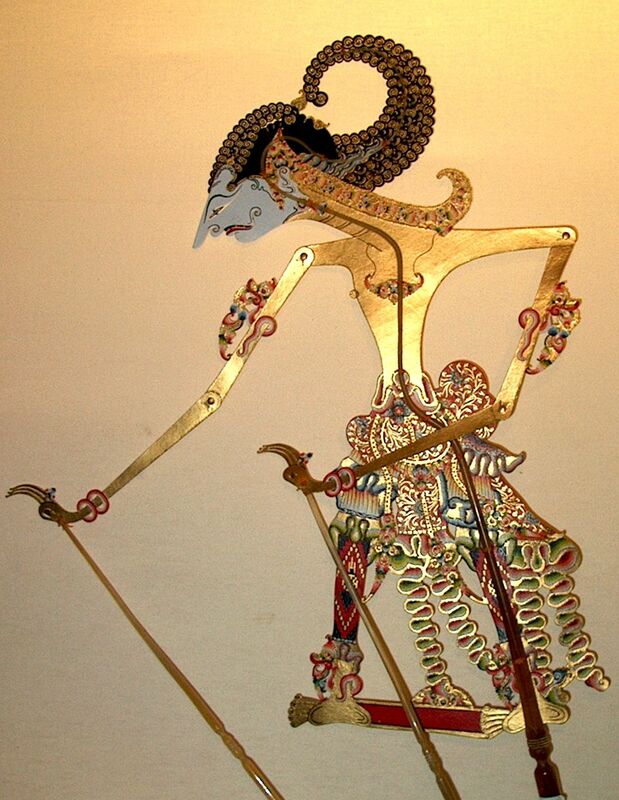 The art of wayang is integrating art of music, role, voice, paint, chisel, and symbol to be invented. By the endeavour of Puppet artists and Indonesian government on 7th November 2003, UNESCO designated Wayang Kulit or Shadow puppet as Indonesian Wayang as a Masterpiece of Oral and Intangible Heritage of Humanity. Thus, Indonesian people especially the youth need to give a good attention to puppet art. The history about origin of Wayang is written on The Book of Centini. Written there that Jayabaya, The King of Kediri Kingdom by the influence of animism and dinamism faiths created Wayang as a ritual media for the followers to connect with the Spirit of the ancestorss. Thus, the followers could worshiped and pleading help to the Spirit of the Ancestorss. Jayabaya was created the Spirit of Ancestors by painting it on the palm leaves. 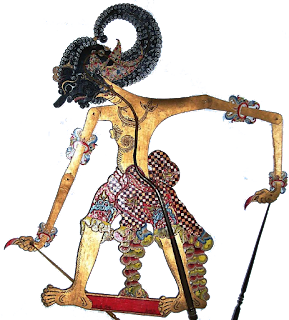 The shape of Wayang itself were replicated from the relief of Ramayana history which painted on Penataran Temple in Blitar. The first figure which plotted was Batara Guru or Sang Hyang Jagadnata which is the embodiment of Vishnu. It’s because Jayabaya was a devoted follower of Vishnu the God of life and peace. Even by the community Jayabaya regarded as an incarnation of Vishnu. The Spirit of the Ancestorss then called as “Hyang” or “Dahyang”, and the intermediaries called as “Syaman”. In the ritual, Wayang is a media that represent Hyang, and Dayang has a role as the intermediaries or Syaman. The history that shown on the ritual itself was about the struggle of the ancestors. 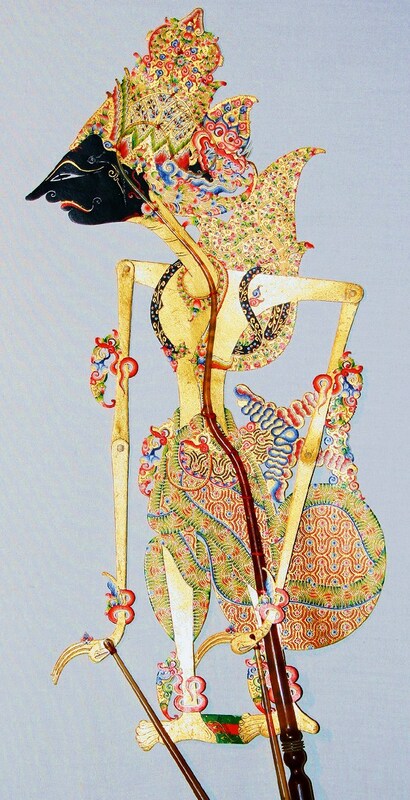 In Jenggala period, the creation of Wayang more growth. After the King of Jenggala (Sri Lembuami) passed away, the government was hold by his son, Raden Panji Rawisrengga with his title Sri Suryawisesa. In his power, Sri Suryawisesa was active to complete the shapes of Wayang Purwa then collected and saved in beautiful chest while its base was created. He could be a puppeteer too if there was an important ceremony with puppet show. 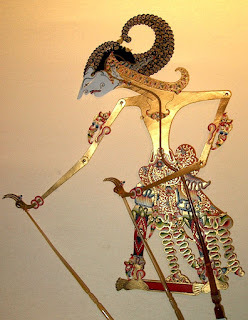 Majapahit period completed the effort of painting Wayang in a paper by added small parts and rolled. That rolled Wayang must be spread out to play, that’s why its called by spreadout Wayang. After Majapahit collapsed by sengkala “Geni Murub Siniram Jalma” (1511 M) Wayang and gamelan was taken to Demak, because its King, Syah Alam Akbar, liked gamelan orchestra and puppet show. Islam entered Indonesia in 15th century brought great changes to societies. Those changes was not only about the shape and how the puppet was shown but also on its functions and contents. The origin of Wayang which was real and proportional like in temple relief became more imaginative. There was many addition and renewal of its equipments such as screen/kelir, lights/blencong, on Wayang Kulit show has symbolic meaning to use another culture. At that time, a number of Moslems thought that gamelan and wayang were haram (forbidden) because they carried Hindu doctrine; which influenced the development of the puppet itself. 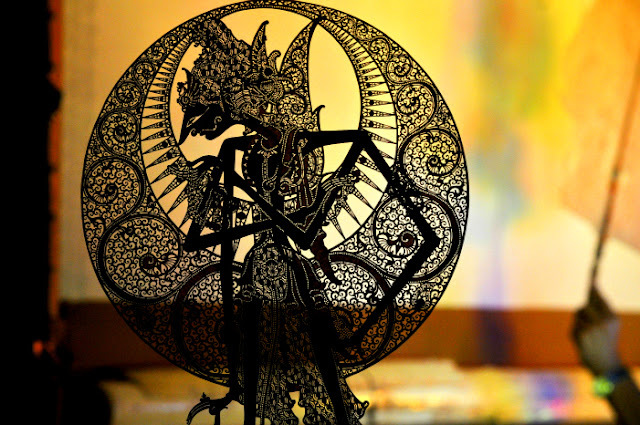 To eliminate the doctrine, a new idea of creating brand new wayang was proposed by removing the person-like design. 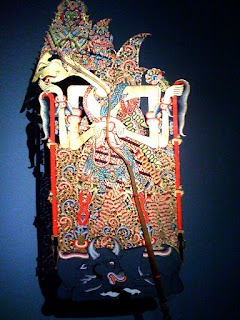 Then, the history of the Indonesian wayang is different from the similar art and culture that have been developed in India, China, and other Southeast Asian countries. Not only the form and the performance are distinct, but also the stories of Ramayana and Mahabarata are different too. The well-known epics have adapted to Indonesian conditions and values; and wayang originality can be traced by the use of its language such as wayang, kelir, blencong, kepyak, dalang, kotak, etc. 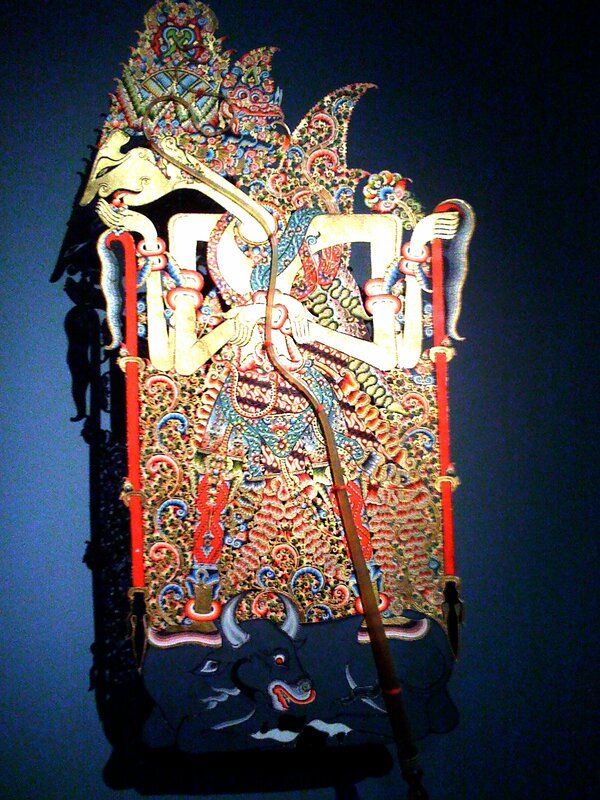 The strength of this wayang culture is the philosophy so that it is successfully developed in absorbing life values. Thus, preserving wayang performance becomes important. In the reign of King Jayabaya, the story of Ramayana and Mahabarata was adapted into old Javanese language. The famous poet were Empu Sedah, Empu Panuluh, and Empu Kanwa. 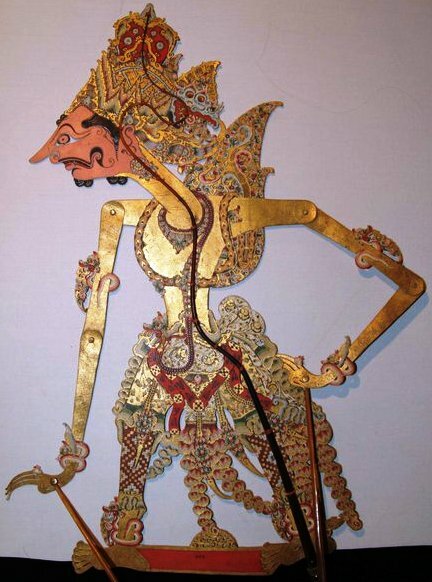 Then, Sunan Kalijaga, one of the Wali Sanga, was the first who created wayang made from oxen and buffalo leather.